The camera you see here just spent a year at the bottom of Deep Bay but is now home thanks to the efforts of a nature photographer and the power of social networks. Here's how he did it. 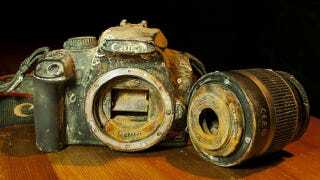 Photographer Markus Thompson recently came across the Canon EOS 1000D during a dive off the coast of Vancouver, BC. After extracting and cleaning the embedded SD card, he discovered that it was, surprisingly, still functional and also contained a number of vacation photos from August 2010—more than a year before he found it. From there, Thompson set about returning the camera to its rightful owner.